The Immigration Department guards the gateway in and out of Hong Kong. They are tasked to prevent questionable figures and criminals from entering Hong Kong. The immigration officers have a highly demanding task in their hands. However, this tough task raises a question - how can the officers accurately verify the identities of travellers? 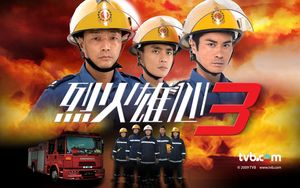 This is the first TV drama series that revolves around the immigration department. While applying for a position in the Hong Kong Immigration Department, Fong Chun Kit makes friends with two other candidates; Cheng Pak Yue and Yip On Kei. Pak Yue is an aggressive and ambitious person. he later moves on to the police force and is promoted to Senior Inspector of Regional Crime Unit. While investigating a case, Pak Yue realises that the new triad leader, Wu Kit Sum has murdered someone because of Chun Kit's wife. This revelation has turned Chun Kit's life upside down. As Chun Kit's good friend, On Kei helps Chun Kit to care for his son. On Kei also suffered a failed relationship with Pak Yue.